This psychedelic-sounding group was formed by singer/guitarist Paul Eastment (formerly of Velvett Fogg) in Birmingham during 1969. Charlie Grima was formerly drummer with the Wellington Kitch Jump Band. 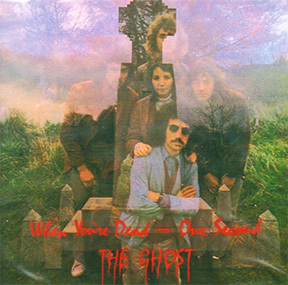 The Ghost had a now very-rare album and single issued on the Gemini Records label. The original name for the group was 'Holy Ghost' but was soon shortened in order to avoid any negative publicity. Coincidentally at about the same time, a struggling Aston band courted potential religious backlash when they changed their name from 'Earth' to Black Sabbath, while another West Midlands line-up risked blasphemy by naming themselves Judas Priest. Local singer/songwriter Shirley Kent later joined the Ghost line-up to help create a sound not unlike the famous American West Coast band 'Jefferson Airplane' as fronted by vocalist Grace Slick. The group started recording an album in 1969 with a single being issued from it entitled 'When You're Dead'. 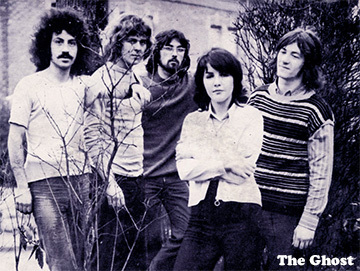 The single and the resulting album that came out in early 1970 on the Gemini Records label, put The Ghost in the "progressive" music category although there was also a strong folk-rock influence probably due to Shirley Kent's involvement. The album's liner notes written by Carl Denker stated; "The Ghost, before the end of 1970, will be the wave that is engulfing all that is new in music today. Listen to this LP with your mind open and each time you will find new voices speaking to you... all voices from the past, which as a matter of fact, are voices from the future." A second Ghost single was issued later in 1970 but Shirley Kent left the group soon after to start a solo career. The remaining members continued after changing the band's name to 'Resurrection' but later split up with no further recordings released. Charlie Grima joined Birmingham's Mongrel line-up before finding pop-stardom as a member of Roy Wood's chart-topping band 'Wizzard' (see The Move). He later embarked on an acting career. Former Ghost members Paul Eastment and Terry Guy also participated on Shirley Kent's solo album that was released in 1975. Danny MacGuire died in 1998.